Home » Minerals (Ionic Elements) Fulvic w/ Ionic Trace Minerals - 4 oz. Minerals (Ionic Elements) Fulvic w/ Ionic Trace Minerals - 4 oz. 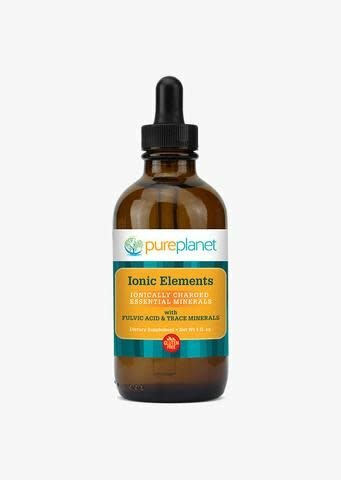 Ionic Elements™ is a specially formulated combination of fulvic acid and over 72 trace minerals . Our body relies on ionic minerals and trace elements to conduct electrical impulses-without them, not a single muscle, including the brain and heart, would function . Additionally, as food passes through the small intestine, minerals are transferred into the blood stream via the intesti- nal tract, a process that only happens if the minerals are ionically charged . Elements to daily regimen . Suggested use: Adults take 20 drops, 3 times daily . For optimum results, circulate the liquid in your mouth for ten to twenty seconds before swallowing . You can also drink it after diluting it in purified water or juice . Ingredients: Supercharged Activated Fulvic Acid; ocean and plant-derived trace minerals, purified water .